Began a process of scholarly dissemination and exchange through local and national conference presentations along with drafting journal articles. Finally, at a less tangible level, the Antipode Foundation’s support has allowed us to create a collaborative social and intellectual space that brings together residents, students, activists, and academic researchers. We believe the work described in this report testifies the promise and benefits of this vision, which is unique in Detroit and perhaps beyond. We expect this vibrant space of exchange to live on well beyond the completion of the work described herein. 2013 has seen Detroit enter into a political and economic maelstrom that is without precedent in modern urban history. In late March, following an official declaration of “financial crisis” by the Governor of Michigan, a state appointed “Emergency Manager” (EM), Kevyn Orr, took political control of the City of Detroit with a mandate to override elect leaders and alter the city budget at will (his first official act was to “allow” the Mayor and City Council to continue to collect their salaries). This state-sanctioned coup d’état at the municipal scale was followed in July with the announcement that Detroit had declared bankruptcy, making it largest city to do so. The Uniting Detroiters project, with its emphasis on convening a diverse set of voices for analysis related to urban and social inequalities and to articulate visions of political change, is now more germane than ever. Detroit has now entered a hitherto unexplored legal, economic, and political space and it appears that everyone from residents to elected officials are struggling to grasp the implications of this unprecedented turn of events. The onset of EM control and the bankruptcy have not changed the direction of Uniting Detroiters Project as much as it has sharpened the focus of our work, especially with regards to our core interest on democratic practices, governance, and the racial politics of accumulation by dispossession. At the same time, however, these events have understandably created “an all hands on deck” situation for our partners and collaborators, stretching their capacity, and contributing to our need to have requested a six month no-cost extension on our project funds (we are very grateful to the Antipode Foundation for this allowance). There are few settings where the relationship between space and social justice is more concrete and visible than the Detroit metropolitan area. Detroit is a predominately (85%) African American City in which 57% of children live in poverty, and where the median income of approximately $25,000/year is half the national average. A decade of capital flight and neglect by property owners (many of which are based outside of the city) has left an estimated 70,000 abandoned structures in the city. A tax-starved public sector has withered to the point that emergency response times in the city vary between 60-90 minutes; 60% of the city’s streetlight do not function. And yet, only a single street separates Detroit from municipalities such as Grosse Pointe Park, which is 85% percent white, and where the median income is over three times that of Detroit. In many such cases, suburbs have literally barricaded the back streets that once connected city to suburb. Detroit: A People’s Atlas builds upon Detroit’s long-standing tradition of thinking through social justice in spatial terms. It takes a cue from pioneering efforts in radical cartography that were led by Wayne State University Professor William Bunge in the late 1960s, whose pioneering Detroit Geographical Expedition featured collaborative mapping projects conducted by students and residents (see, for example, Bunge 2011). The goal of the Atlas is to offer critical analysis of the processes of racialized dispossession affecting the city (varying from individual home foreclosures to the emergency manager and bankruptcy) while at the same time taking stock of the often-unacknowledged social justice work that has long been central to Detroit’s history. The Atlas therefore maps social, political, and racial inequalities while also drawing on the creative energy of residents to chart different visions of urban democracy, governance, and revitalization than those which prevalent in the local (and global) neoliberal urban policy discourse. The Atlas is based on the idea that creating maps is not merely about knowing where things are in space, but politically locating ourselves in relation to our neighbors and communities, asserting control, and making demands upon leaders. The Atlas is being overseen by a ten member advisory board made up of academics, residents, and activists: Shane Bernardo, Linda Campbell, Wayne Curtis, Shea Howell, Carmen Mendoza King, Andrew Newman, Gregg Newsom, Lottie Spady, Sara Safransky, and Aaron Timlin; the editors are Campbell, Newman, and Safransky. Our call for submissions resulted in 23 submissions by current and former residents (as well an entry from adjacent city of Windsor across the Canadian border) that vary from critical essays, to poetry, to photography. We have also been fortunate to have assistance of Detroit residents Dennis Sloan, James Johnson, and Ayana Heaumann to collect oral histories, along with the help of a WSU student, Justin Thompson. Maps are currently being generated through a consultation process between residents and Olivia Dobbs (a Wayne State University student proficient GIS); other maps have been hand drawn at workshops (see below). We expect a draft of the Atlas to be complete by January 2014, with a full book proposal ready by May of 2014. 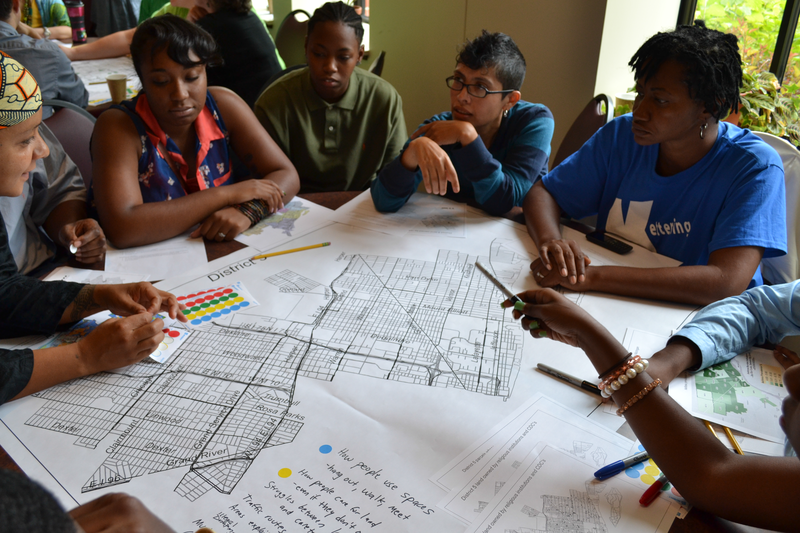 A core of part of the Uniting Detroiters vision has been to create sites of mutual learning and analysis that build on Detroit’s history of organic and scholarly debates related to spatial inequalities. The creations of three Land Justice Workshops were a centerpiece of this element of the project. Land Justice workshops were held at three sites in Detroit (The Casey Solanus Center, Michigan State University Detroit Center, and the Black Tie Collective) between 2012 and 2013. The workshops often began with presentations by core team members and WSU students that focused on translating concepts such as counter-cartography into specific skills and tools (i.e. the use of handheld GPS and mapping). Presentations were kept short so that the majority of the meetings involved breakout sessions and visioning activities in which audience members discussed topics such as “property”, “land-dispossession”, and “the commons.” Breakout sessions were the highlights of the meetings because they allowed the Uniting Detroiters Team members to learn from participants and created a rich space of exchange between residents and activists who, in many cases, had not previously met. These meetings, while valuable in themselves for team members and our fellow citizens, have also been a core part of the generative process of the People’s Atlas project. The workshops become important sites of connection for future relationship- and movement-building. In fact, our activities (and Linda Campbell’s leadership) ultimately helped to set the stage for a June meeting known as the “People’s Platform” in which over 200 Detroiters came together to discuss participatory democracy and social justice issues centered upon a variety of issues ranging from land, food, environment, and transit. In this sense, our project has helped to provide the intellectual frame for a significant and hopeful mobilization for participatory democracy in Detroit. Given the fluid political situation facing the city, the mobilization (and the broad network of organizations it represents) continues to evolve and grow each week. While most of Detroit’s factories have been shuttered long ago, the Motor City remains a highly productive site for popular discourses on race, class, capitalism, and postindustrial society in general. The last decade alone has seen a boom in documentary films in particular; sometimes it appears one can scarcely drive past an abandoned building in Detroit without noticing someone filming there. One only has to live in the city for a short period of time to be able to accurately predict the specific street corners that appear as b-roll in what has become an increasingly formulaic and contrived genre of apocalyptic, allegorical “Detroitsploitation” documentaries (some genre defining examples – which vary greatly in quality – are Requiem for Detroit , Detroit Lives , After the Factory , and Detropia ). Given this charged climate of representation, the Uniting Detroiters Project is producing a short film that highlights voices, perspectives, and experiences that are excluded from this current “drive-by documentary” genre focused on Detroit. The film is drawn from interviews with 47 life-long activists, varying from young people to those engaged in the city for decades in variety of areas, including immigrant rights, civil rights, school reform, environmental justice, and youth prevention. The film focuses on airing analyses of inequality and visions of change from a diverse set of actors who varied experiences and social positions, making for an intriguing set of divergences and convergences when discussing the city. While the documentary is relevant for the discussion of grassroots responses to neoliberal reform at a global level, it was designed as learning tool for activists, community groups, and Detroiters in particular. The film is meant to provoke questions and provoke analysis through the presentation of mostly unheard experiences and perspectives on a familiar topic. Our plan to is to distribute the documentary free of charge to community organizations in the city. As of August 2013, the storyboard for the documentary is complete and the editing process is set to begin. One year into our project, we are in an early stage of the writing process. We have made scholarly presentations on the work at a 2013 conference at Wayne State (Urban Disruptions@Wayne) and at the 2012 Annual Meetings of the American Anthropology Association in San Francisco. This latter presentation led to a editor’s solicitation for an article for the journal Anthropology Now; we are currently drafting manuscripts for this submission as well as a planned submission for Antipode. After the Antipode submission is completed, further manuscripts will targeted at journals such as International Journal of Urban and Regional Research, Environment and Planning D: Society and Space, Theory, Culture, and Society, and City and Society. At the global level, our work will make three principal (and interlinked) theoretical contributions: 1) It uses the case of Detroit’s redevelopment and bankruptcy to show how the neoliberal “production of space” can actually entail the shrinking or “downsizing” of a major city. The provokes a rethinking of assumptions that neoliberal urbanism is “growth driven” as well as a reconsideration of growth and expansion based assumptions in Henri Lefebvre’s framework as well; 2) We demonstrate the importance of mapping technologies in both reproducing (and contesting) this neoliberal production of space in Detroit; and 3) We also point out the importance of a “participation regime” to this urban planning process, which masterfully conjures artifacts and paper trails attesting to public participation without acknowledging or yielding ground to dissenting voices. A book proposal for The People’s Atlas is being prepared we expect to submit it to a university press in Spring of 2014. As of now, Wayne State University Press has expressed interest in the project. It is our likely first choice. Given the press’ history of publishing work by prominent Detroit activists, we think it could provide a bridge between a global scholarly audience while still retaining appeal for Detroit-focused activists and residents. We wish to close this report by expressing our heartfelt thanks to the Antipode Foundation for their support for the project. We would also like to single out Andrew Kent from the Antipode Foundation for special thanks: his assistance and professionalism has been absolutely excellent throughout the project. Linda Campbell, Andrew Newman, and Sara Safransky are just a few of the many individuals who made this project possible with the Antipode Foundation’s support. The others include Danielle Atkinson, Heidi Bisson, Olivia Dobbs, Ayana Huemann, James “Jimmy” Johnson, Gregg Newsome, Emma Slager, Denis Sloan, Justin Thompson, and Jeremy Whiting.